A candidate with a visible tattoo will almost always come across as “dirty” or “unsavoury” to hiring managers, a new study has found. Even employers who don’t have a personal objection to tattoos will think twice about hiring someone with ink, simply because they fear it could damage the company’s corporate image. The research, from the British Sociological Association, found candidates bearing tattoos carry a clear stigma from an employer perspective, The Telegraph reported. 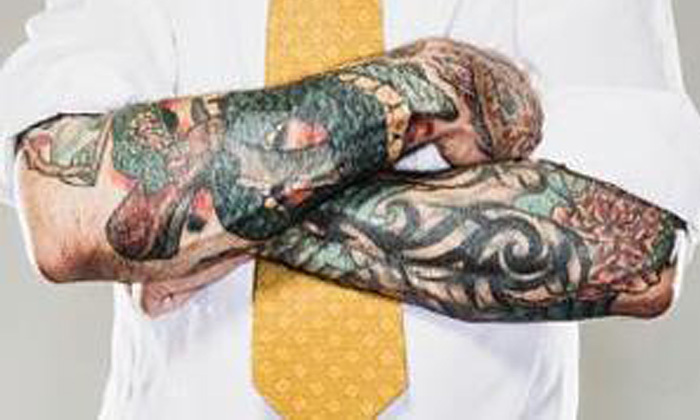 “Respondents expressed concern that visibly tattooed workers may be perceived by customers to be ‘abhorrent’, ‘repugnant’, ‘unsavoury’ and ‘untidy’,” Dr Andrew Timming of St Andrew’s University School of Management told the paper. One woman also said they make a person “look dirty”. However, the study also found those with tattoos can turn the body art to their advantage – if they want to work in certain professions, such as becoming a prison officer. It also found a small number of tattoos can be seen as a positive image, particularly if they reference a “badge of honour” for military veterans. “Hiring managers realise that, ultimately, it does not matter what they think of tattoos – what really matters, instead, is how customers might perceive employees with visible tattoos,” Timmings said. Hong Kong is going mobile and employees could have more cashless options for getting to work in the future. ..